Now, to be clear, I’m not saying Charlie Whitehurst IS Jesus Christ but rather that the two share a similar coiffure. Also, to be fair, Jesus would have found a few more open receivers than Whitehurst did during the Seahawks triumphant 16-6 victory over the St. Louis Rams. Congrats to Seattle on clinching the NFC West and in the process becoming the worst NFL team EVER to make the playoffs. 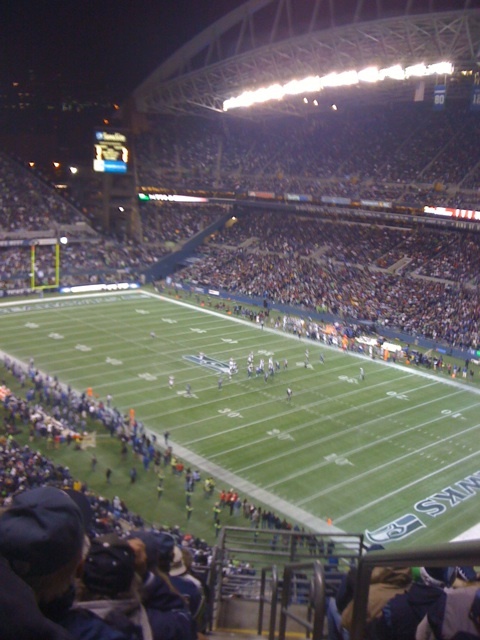 There is a lot to like about Qwest Field, home of the Seahawks. For starters, it’s the loudest stadium in the NFL. The “12th man” is responsible for a minimum of two false start penalties a game. It might be the one pro crowd that sounds and feels a lot like a big time college football stadium (think Autzen Stadium). Whenever I watch a game from Seattle, all I can think about is Bo Jackson absolutely “truck sticking” Brian Bosworth on Monday Night Football. I was too young to remember the game myself but, to this day, my Dad swears it was one of the best individual performances he ever witnessed on MNF. Seattle fans may disagree but honest football fans cannot dispute the pure brilliance of Bo. So Qwest Field, speak up. Are you louder than a college crowd? Share your views.